Jason Holcombe is the grandson of the founder of THG Rental and Sales. Jason’s grandfather opened the doors in 1974 when Jason was only four years old. Jason could barely crawl up on one of them mowers in those days. Jason spent a lot of time between Florida and California, living in California with his mother in the winter and living in Florida with his father the summer at the rental yard. After working in the banking industry, along with other things and getting his degree in business and administration Jason decided to go to work for his father in Clearwater at the rental yard. Probably giving up scuba diving in Humboldt and Fort Bragg, California was the hardest part of the move. He still misses freshly caught abalone and salmon from the Pacific Ocean. Another of Jason’s loves are working with ARC, Tampa Bay Special Needs Down Syndrome Association. He also works with the boys and girls club of Humboldt. I’m sure that anything they need THG Rental and Sales will be able to provide it as they have everything (maybe a little exaggeration here). THG Rental and Sales Proudly Serves, Pinellas, Hillsborough and Pasco Counties. Their equipment Showroom is Located in Clearwater, Florida and they will Deliver anywhere in the Tampa Bay Area. THG Rental and Sales stands for quality and dependable rental equipment. They have superior sales and the highest quality customer service. 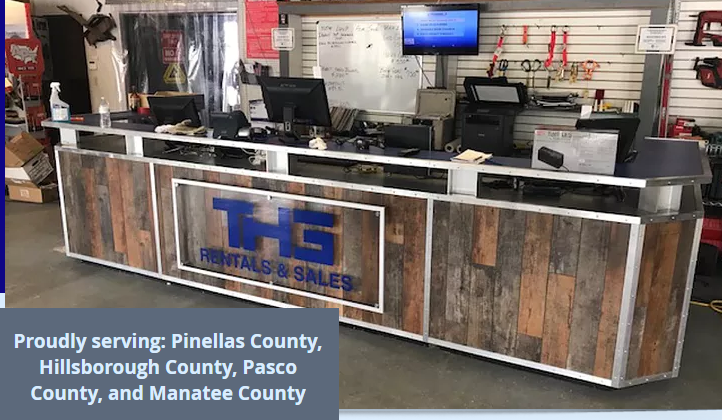 THG Rental & Sales features the Tampa Bay area’s most comprehensive inventory of the best in brand name equipment, contractor supplies, and OSHA approved personal protective apparel. Whether you’re a homeowner, contractor, or require a specific industrial application, THG Rental & Sales is the one-stop shop for all of your project needs. You can contact THG Rental and Sales at 1886 N. Hercules Ave, Clearwater, Florida 33765. And their phone number is 727-461-7511. If you’ve been dying to try one of those ride on mowers that will turn on a dime that the commercial more people use, you can rent one of them right here. A Brand-new John Deere mower. You have to call Jason to find out what they are and what they do but they sure look powerful. I’m not sure they are for use in your living room. Jason’s number at THG Rental and Sales is 727-461-7511. If you have any questions you can always ask Jason because I think he’s going to be around for another hundred years (my last exaggeration).